Tetrarch 12:43 pm 20th March 2009. Unique cibachrome print. 40 x 60 inches. Tetrarch. 3pm 17th November 2005. Unique cibachrome print. 40 x 60 inches. Tetrarch 2:29 pm 8th October 2008. Unique cibachrome print. 60 x 40 inches. Tetrarch 3:38 pm 8th October 2008. Unique cibachrome print. 60 x 40 inches. ANIMA 7. 2009. UNIQUE CIBACHROME PRINT. 40 X 60 INCHES. Tetrarch 4:44 pm 7th April 2008. Unique cibachrome print. 40 x 60 inches. Tetrarch 12:11 p.m. 8th October 2009. Unique cibachrome print. 60 x 40 inches. Tetrarch 1:27 pm 10th September 2009. Unique cibachrome print. 40 x 60 inches. Christopher Bucklow was born in Manchester, England in 1957. His works are in the collections of major art museums internationally, including the Museum of Modern Art in New York, the Metropolitan Museum of Art, the Victoria & Albert Museum, and the Museum of Modern Art in San Francisco. 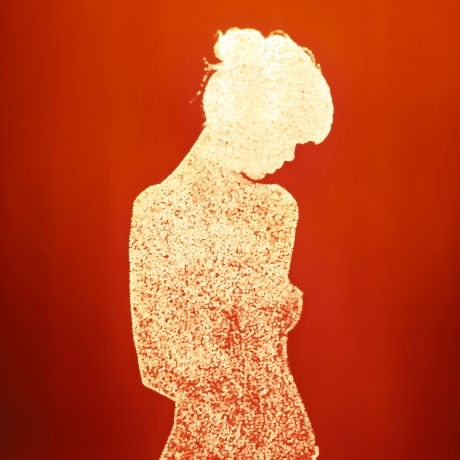 Bucklow is best known for his luminous silhouette photographs, works that place him within a movement building since the early 1990's of British photographers who have taken the art of the photogram into ever more novel, interesting, and technically and conceptually challenging territory. Bucklow's first show at Danziger Projects is comprised of eight recent large-scale images that continue his long engagement with the ethereal figures that have become his trademark. These other-worldly photographs of radiant men and women set against grounds of color are made through a multi-step process that is both complex and laborious. Bucklow begins by projecting the shadow of his sitter on a large sheet of aluminum foil and tracing its outline. He then makes thousands of small pinholes in the foil silhouette, one for each day of the subject's approximate lifespan. Using a contraption of his own device that places the foil over a large sheet of photographic paper, Bucklow wheels his homemade "camera" out into daylight and pulls the "shutter" to briefly expose the paper to direct sunlight. Thus each finished picture becomes a kind of photogram silhouette composed of thousands of pinhole photographs of the sun. The intensity of light on a given day and the length of exposure create unique color variations on how the resulting piece appears. Following the artist's particular ground rules, and connecting Bucklow to the mystical tradition of British artists, in particular to the work of William Blake, Bucklow does not picture anyone he has not dreamed of. In this way, the works connect more deeply to both the artist's unconscious and the unknown. Part quantum physics (in particular the light bending phenomenon of the double slit experiment) and part zen philosophy, the thousands of suns not only shine out from the paper but are a window into the soul or anima of both subject and artist. Seeking to close the perceived gap between the thing and its depiction and searching for an immediacy and a tactility not inherent in traditional photography, Bucklow and his "camera-less" colleagues (Derges, Fabian Miller, Fuss) have found a way to avoid the delay between the release of the shutter and the production of the print. More than anyone in the group, however, Bucklow's explorations into avoiding the negative are both literal and figurative, connecting light and art, with the Other. We may not readily associate photography and the mystical or spiritual, but as Bucklow says in the following interview with the science fiction writer, Ted Kosmatka, "Deep down my theme might be love (or) the effect that love has on one's state."